coriander rice recipe | cilantro rice | coriander pulao or kothamalli rice recipe with detailed photo and video recipe. 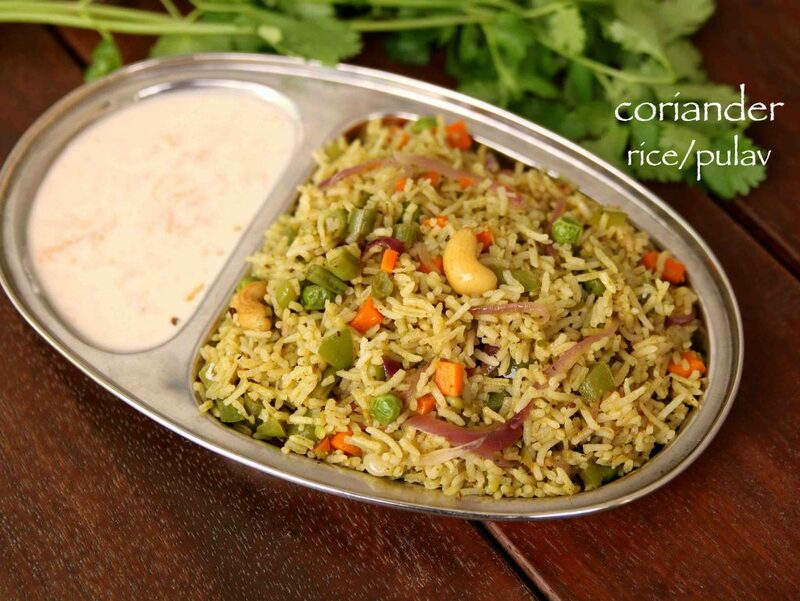 an authentic south indian rice-based recipe filled with veggies and infused with fresh coriander aroma. 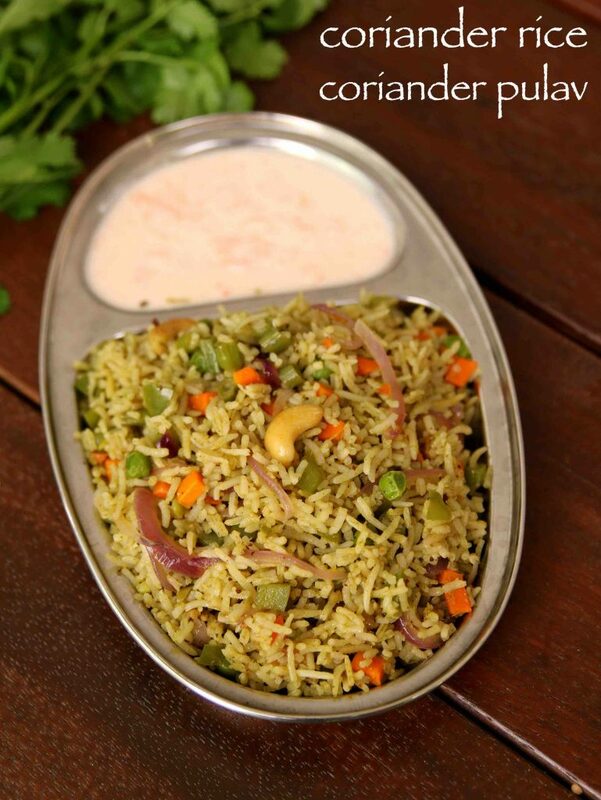 in south india coriander pulao is mainly prepared for breakfast but it can also be an ideal lunch box or tiffin box recipe too. it tastes great without any side dish but can also be served with any basic raita or kurma recipe. coriander rice recipe | cilantro rice | coriander pulao or kothamalli rice recipe with step by step photo and video recipe. south indian cuisine has many variations of rice or pulav recipe prepared with choice of vegetables as its key ingredients. 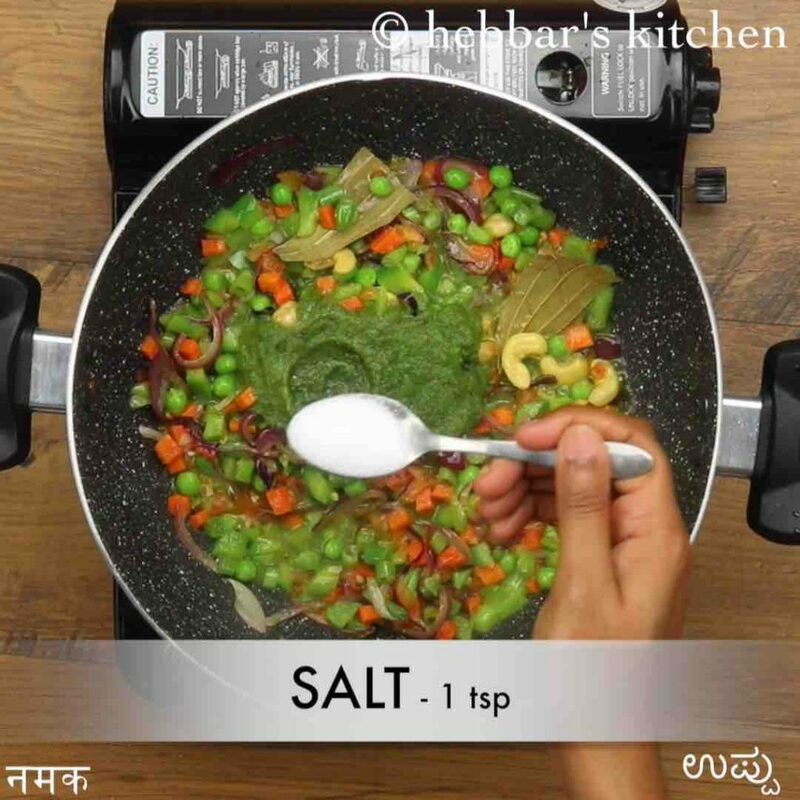 this recipe post uses freshly grounded coriander leaves with other herbs and finely chopped vegetables. it is one pot meal by itself with supplying all the balanced nutrients. the recipe for coriander rice is very simple and is generally prepared with the leftover rice from the previous day. 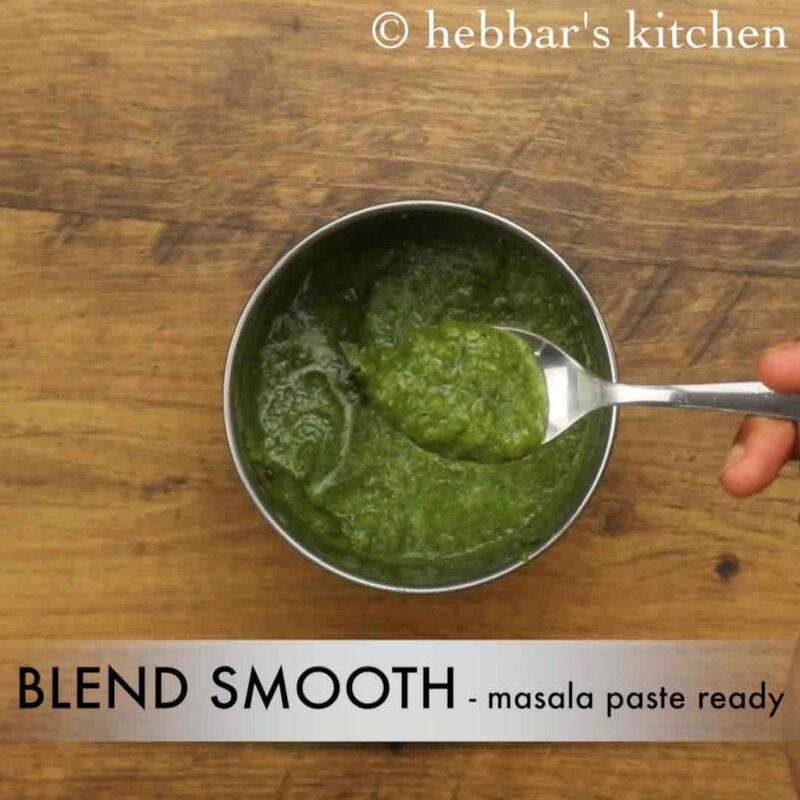 basically, i have used fresh coriander leaves grounded in other dry spices to prepare the fresh and green masala paste. later it is then mixed with choice of finely chopped vegetables in cooking pan to prepare vegetable pulao base. once the base with vegetables is properly cooked, it is then mixed with leftover rice till the masala is absorbed. 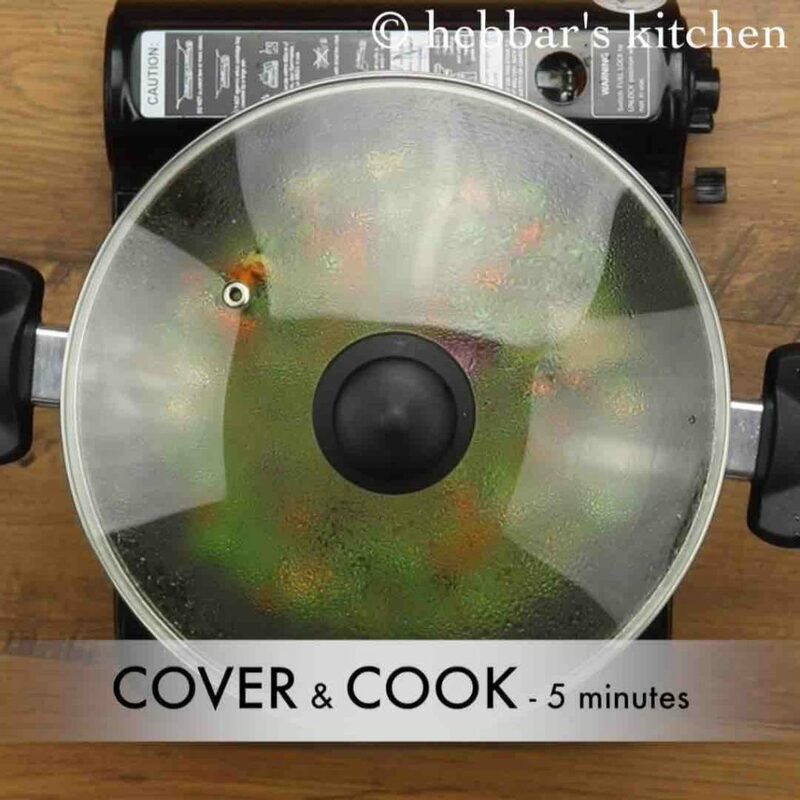 having said that, you can also prepare it in a pressure cooker way too. so once the masala paste is ready sautee it for 4-5 minutes and then mix it with soaked rice and pressure cook it with 1:2 rice to water ratio. 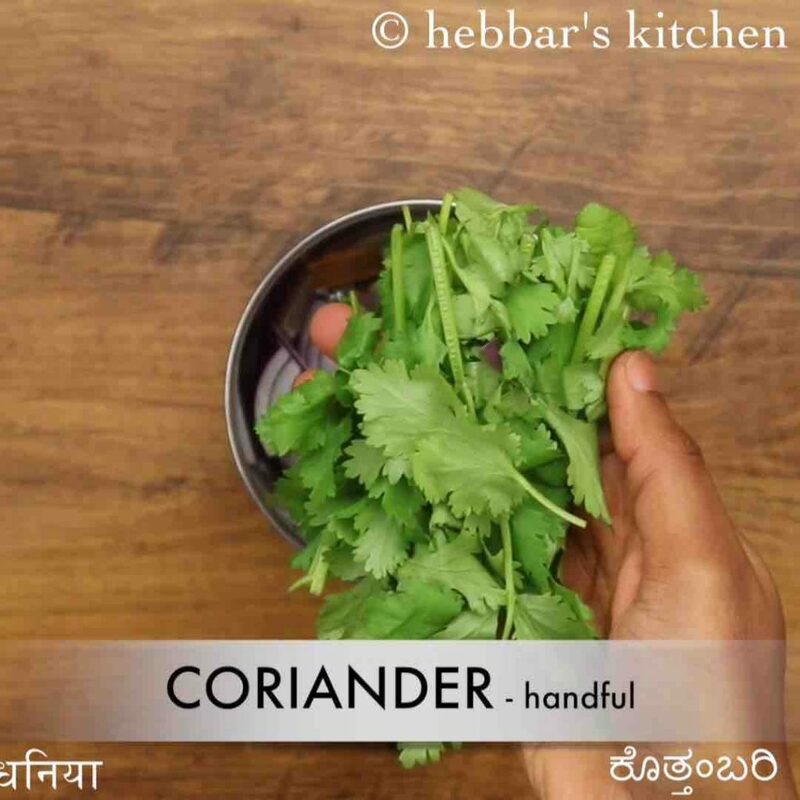 furthermore, some important tips and suggestions while preparing the simple coriander rice recipe. firstly, in this recipe i have used only fresh green coriander leaves herb for the masala paste. but you can easily experiment by adding equal amount of pudina or mint leaves too. secondly, as i mentioned previously, adding vegetables is open-ended and you can add choice of vegetables. i would recommend you to add finely chopped veggies so that it gets cooked evenly and properly. lastly, if you are planning to add cooked rice, ensure it is completely moisture free with no moisture. 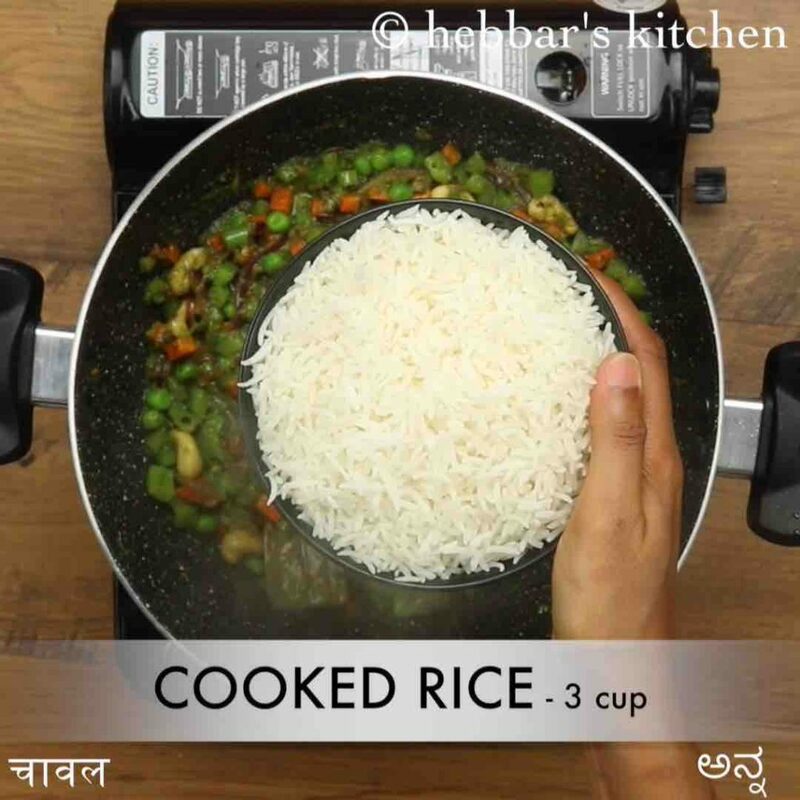 ideally, leftover rice is best suited, but you can also manually dry the freshly prepared rice before using it. 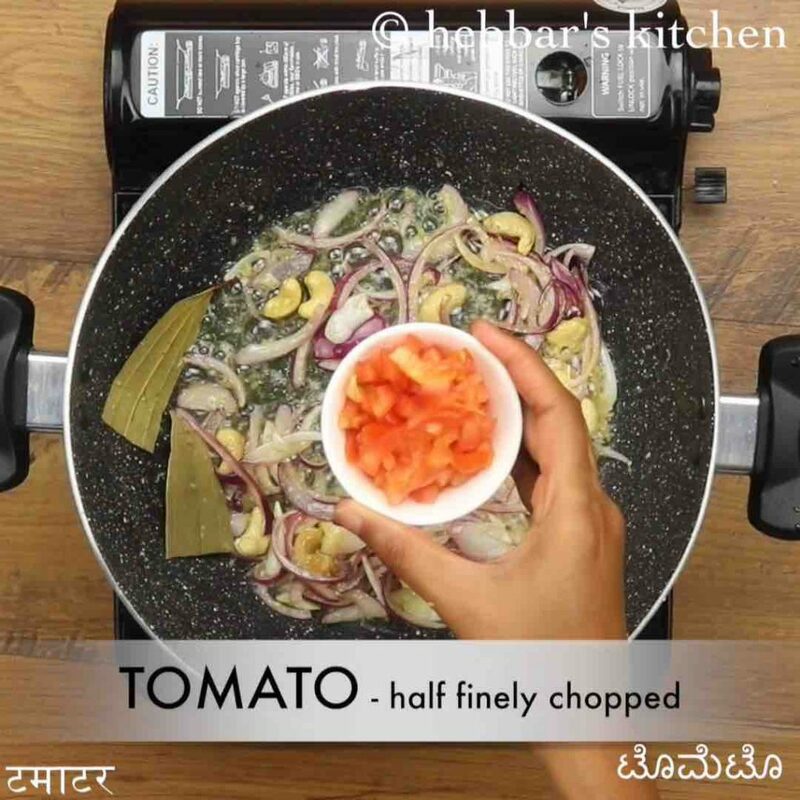 firstly, in a small blender take ½ onion, 8 cloves, ½ tsp pepper, 1 inch cinnamon, 2 green chilli and handful coriander leaves. blend to smooth paste adding 2 tbsp of water or as required. keep aside. 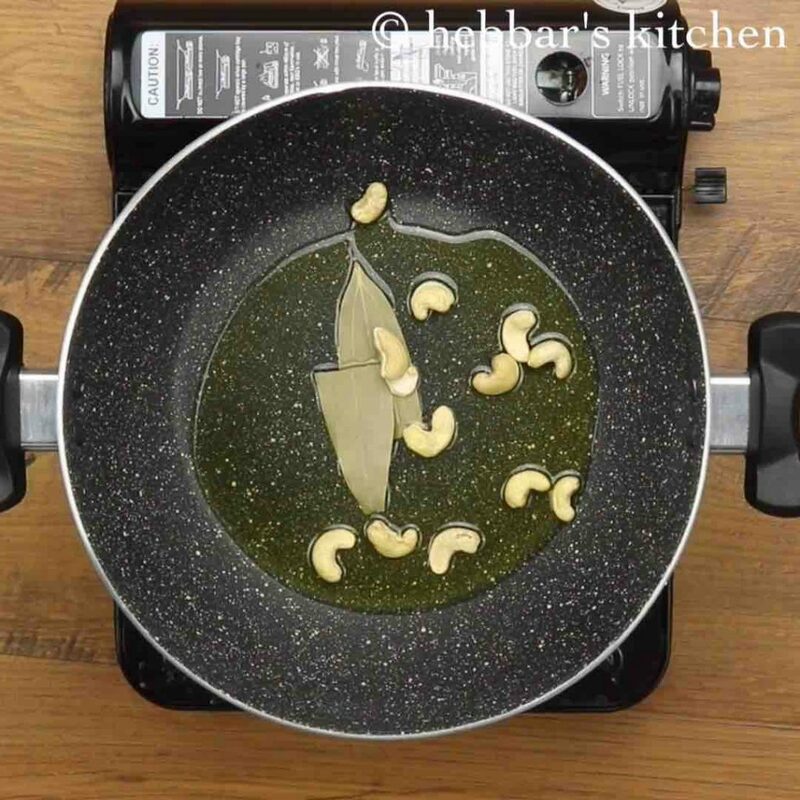 in a large kadai, heat 1 tbsp ghee and roast 1 bay leaf and 13 whole cashew. also saute ½ sliced onion followed by 1 tsp ginger garlic paste till the raw smell disappears. now add ½ tomato and saute till the tomatoes turn soft and mushy. 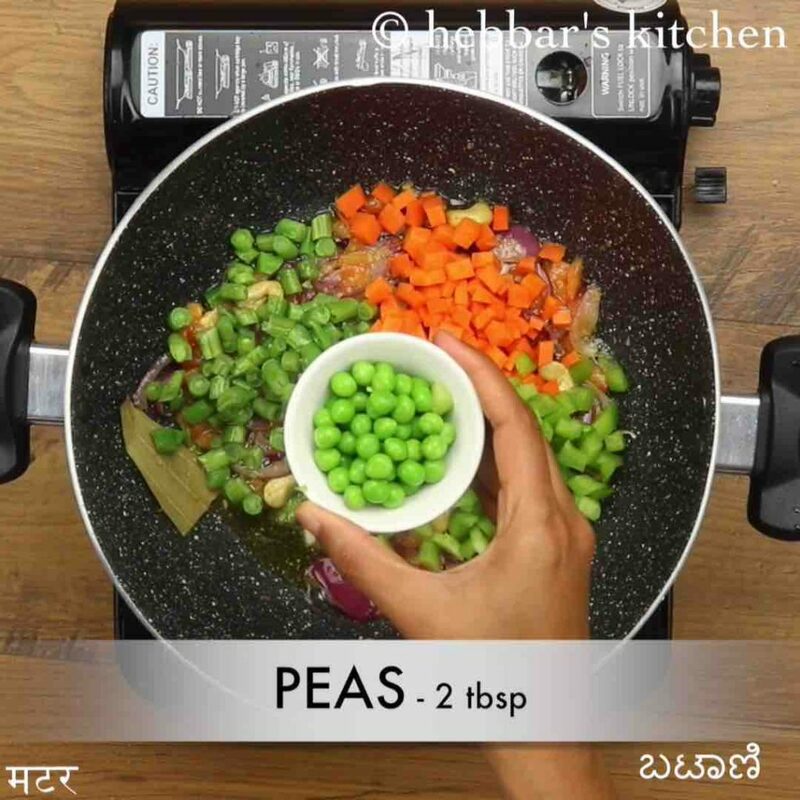 additionally, add 5 beans, ¼ carrot, ¼ capsicum, 2 tbsp peas and saute for a minute. add in prepared masala paste along with 1 tsp of salt. mix well. 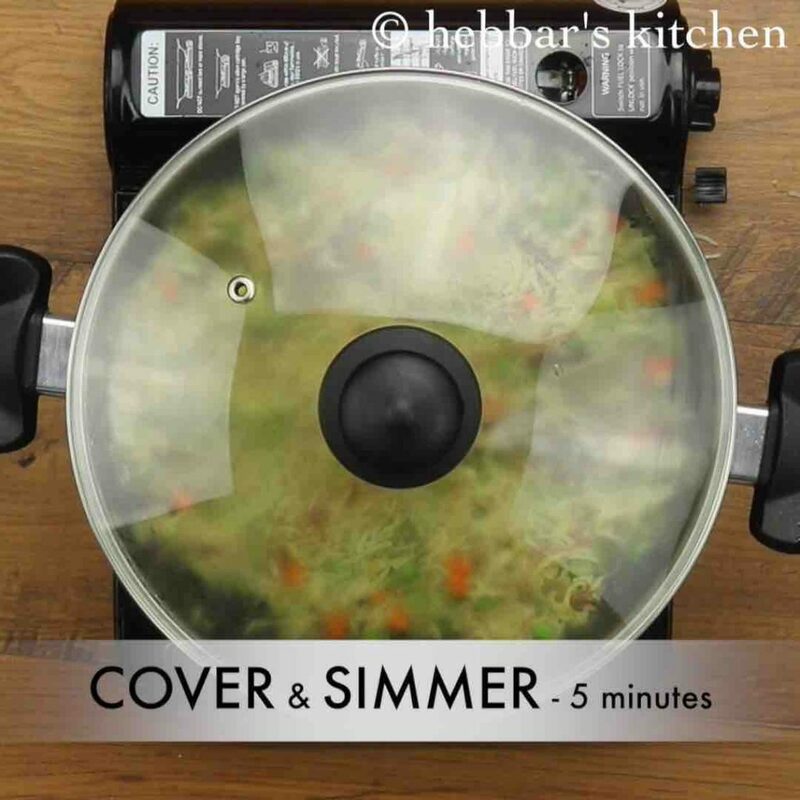 cover and cook for 5 minutes, or till vegetables get cooked completely. now add in 3 cups of cooked rice and mix gently. cover and simmer for 5 minutes to absorb all masala. 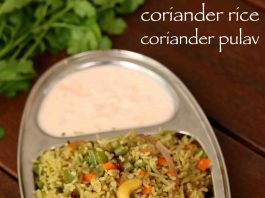 finally, serve coriander rice / coriander pulav with raita of your choice. firstly, add vegetables of your choice like snow pea, broccoli and potato to make more nutritious. additionally, use leftover rice to prevent rice from turning mushy. furthermore, add mint leaves along with coriander leaves to make more flavourful. finally, coriander rice / coriander pulav recipe tastes great when served with raita.